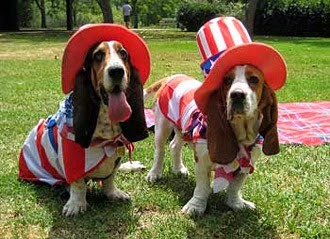 For 240 years America’s dogs have tolerated our Independence Day shenanigans. Whether we are taking them on a trip or dressing them up and parading them around town, blowing up fireworks, or simply leaving them home alone while we go out to celebrate America’s birthday one thing we cannot ignore is that the 4th of July causes more stress and anxiety to our favorite pets than probably every other day of the year (except perhaps vaccination day). I have been fortunate that with the exception of one occasion my dogs have successfully managed their own stress levels successfully. The one year we had a problem, we happened to be living in an extremely noisy apartment complex (I mean, it was horribly loud always, but most especially at night.) And my dear sweet Forest jumped on my bed and peed right there in the middle of my duvet cover. That was several years ago and we have not had any problems since that time. Some dogs however have such a terrible fright each year that their owners take the risk and expense of giving their beloved pets sedatives (hopefully via a vet or veterinary assistant). Well, now their appears to be a better way. The product is called ThunderShirt and it is a dog anxiety vest. It is too late to buy this product for tonight’s explosive excitements, but check it out, it may help alleviate your furbaby’s future anxiety — and yes, they do make them for cats as well!